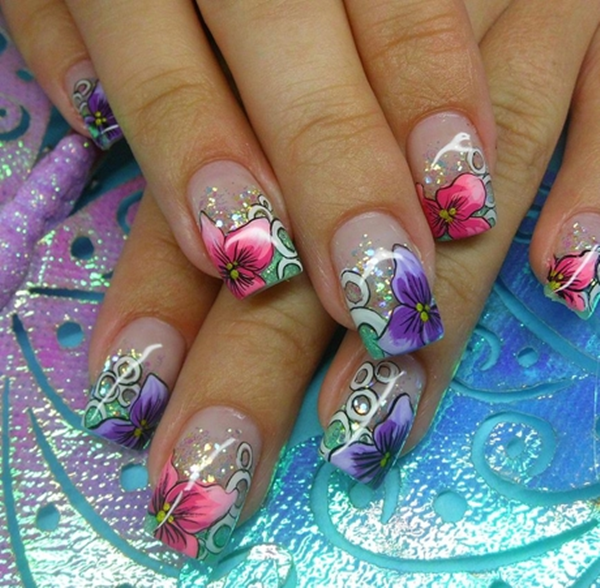 Nail art design has seen some major improvement, these days your choices aren’t limited to French tips or stick on nail art as nail technicians learn new techniques. 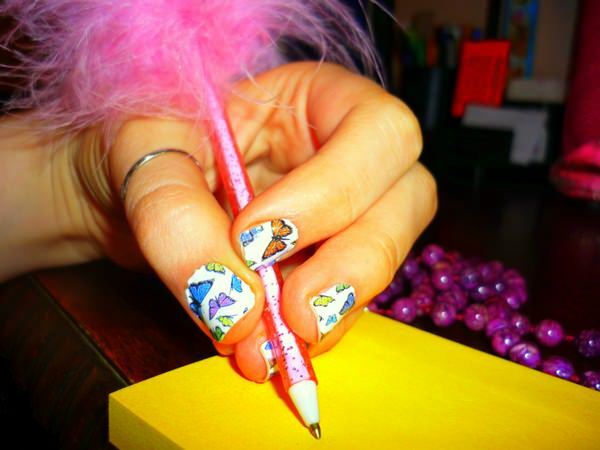 You also get specialized brushes and pens which is designed for nail art. 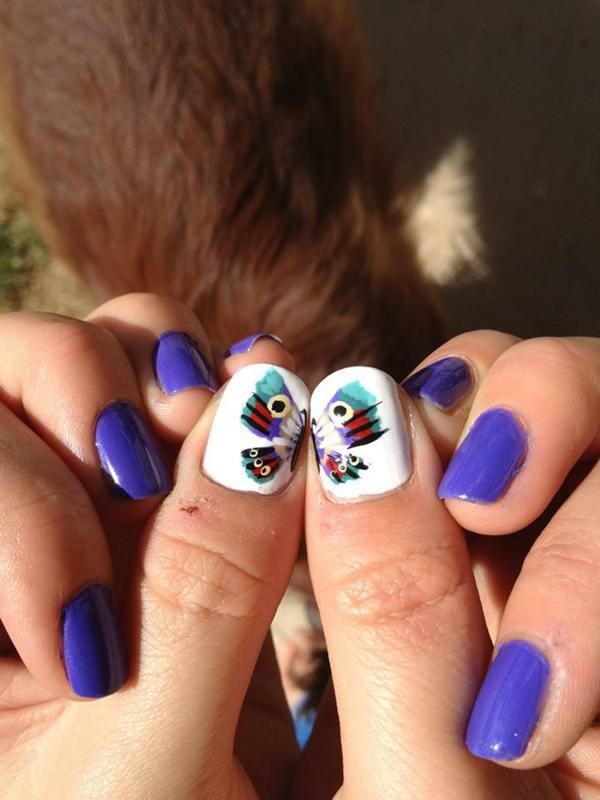 The design possibilities are endless and with the nail art printers you can even add photos to your nails. 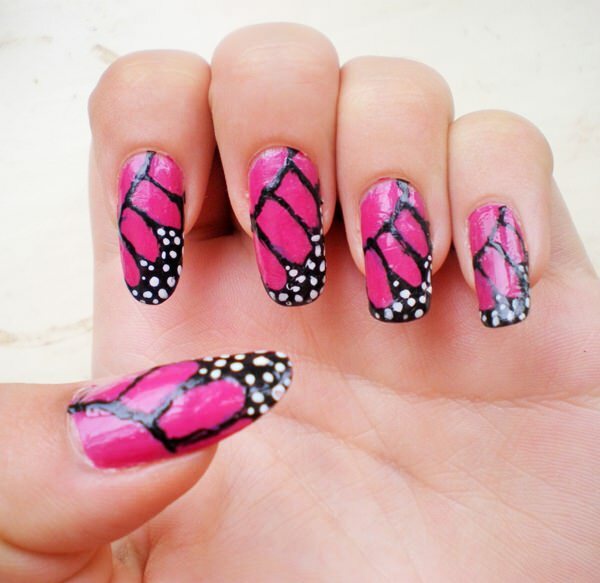 Although this opens so many new possibilities when it comes to nail art most girls love the butterfly nail art and with endless possibilities when it comes to butterfly designs you will definitely not have the same as everyone else. 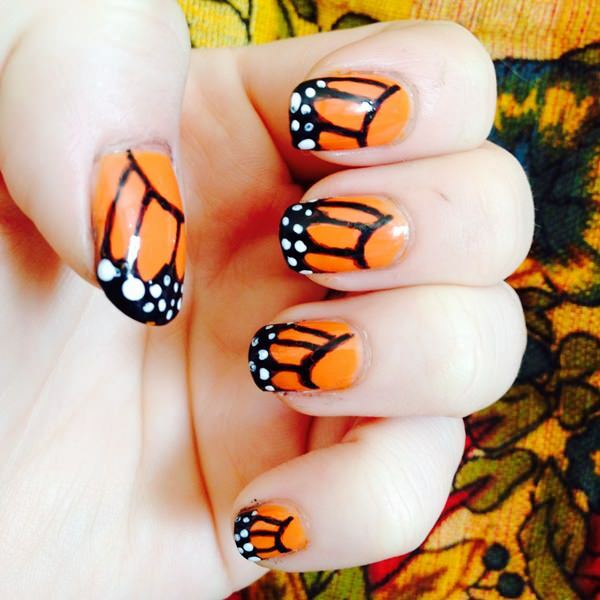 The color possibilities for your butterfly designs can be anything you want them to be which means this design fits in with any outfit you are planning if you need nails done for an event. 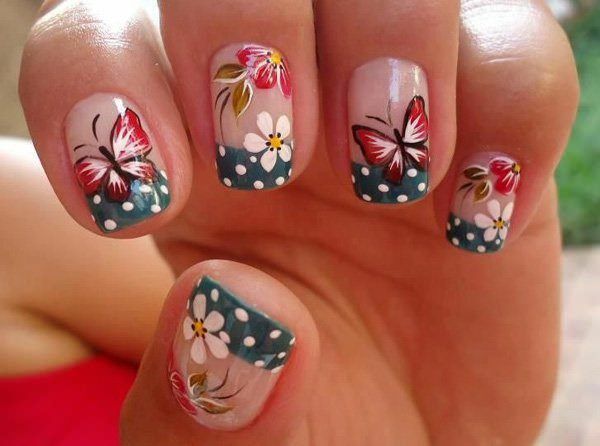 This is a great design if you want something simple looking but still quite beautiful. 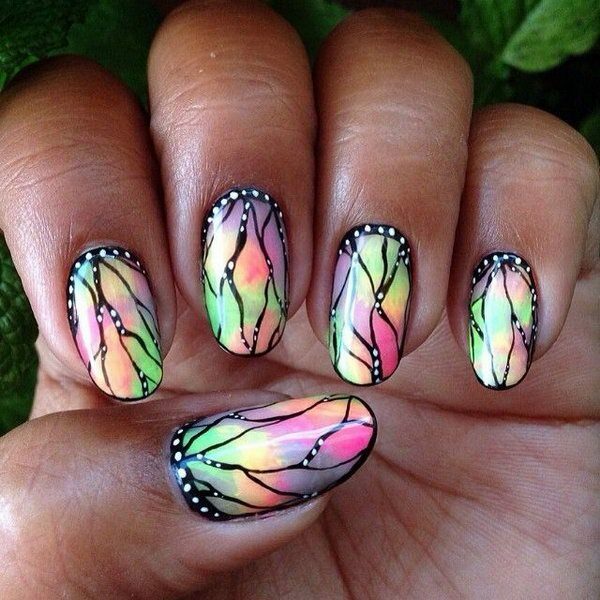 This can normally done by nail art printers, Stickers or if you have one of those amazingly talented nail technician they might actually paint these on that might be a bit of a timely process but the end result will be simply stunning. This design is for everyone that likes a bit of a different design. 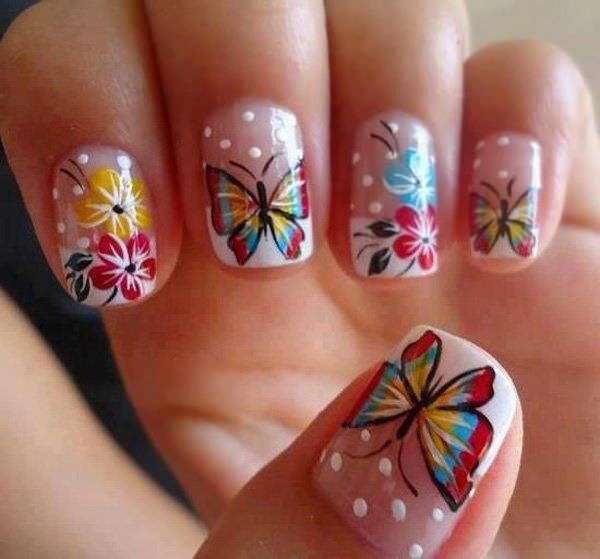 Only two of your nails here will have a small butterfly and then some flower design and the rest is just a plain colour this will just make sure people’s attention goes towards the design and seeing that all of these designs are painted on and not sticked on makes it gorgeous and you get to appreciate the work more. It might be simple but to paint all the detail will not be a 20 min job this will take some time but in the end you have beautiful nails for any occasion. Although this design might look plain and simple it is not. 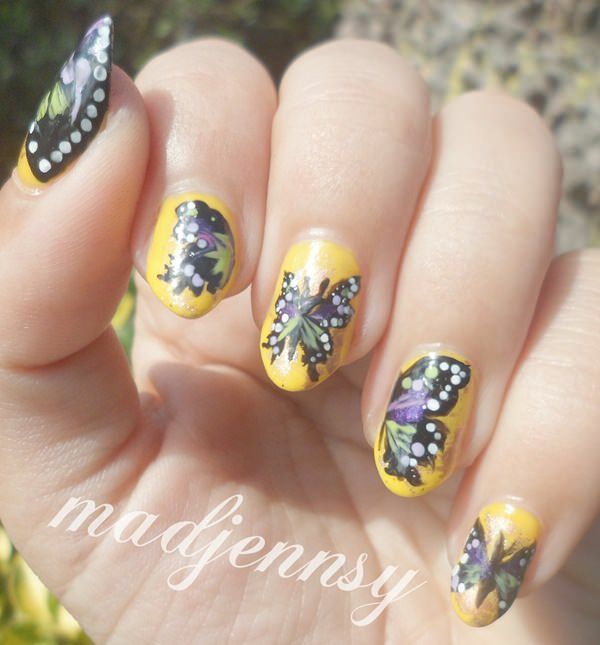 The butterflies an flowers has quite a bit of detail and this is definitely not one of the amateur looking designs yes sure it has the fun element but it is fun without looking childish and that is mainly due to the details that every element has. I love this design simply because it is not too over dramatic but also far from plane. This can also pass as a semi-formal design and a great design for everyday this will fit in with just about any event. 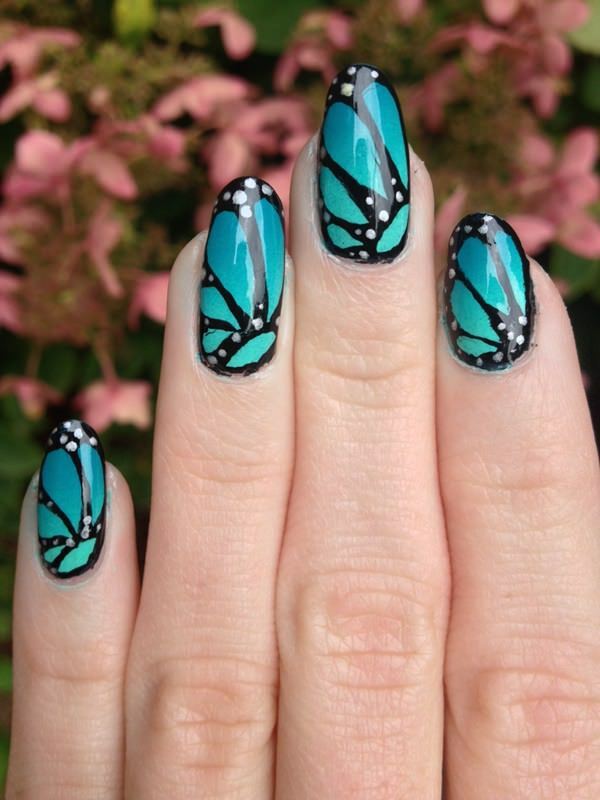 This design is actually quite amazing because the one butterfly per hand design really looks great and it puts a huge emphasis on the butterfly and the detail that is involved in painting it. This might look like quite a plain design but it is suitable for any occasion and will look great with anything. 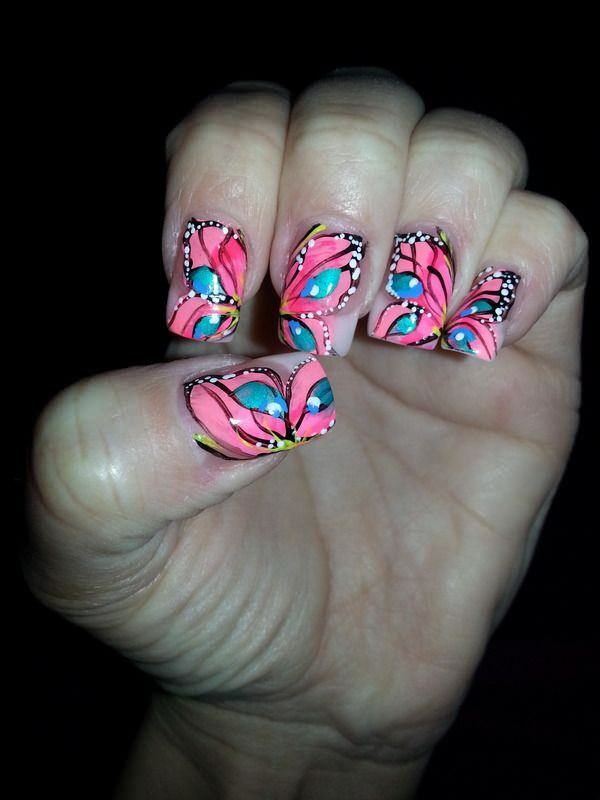 They are a great design to choose if you don’t want your nails to look overly done and busy, this is an eye catching design. 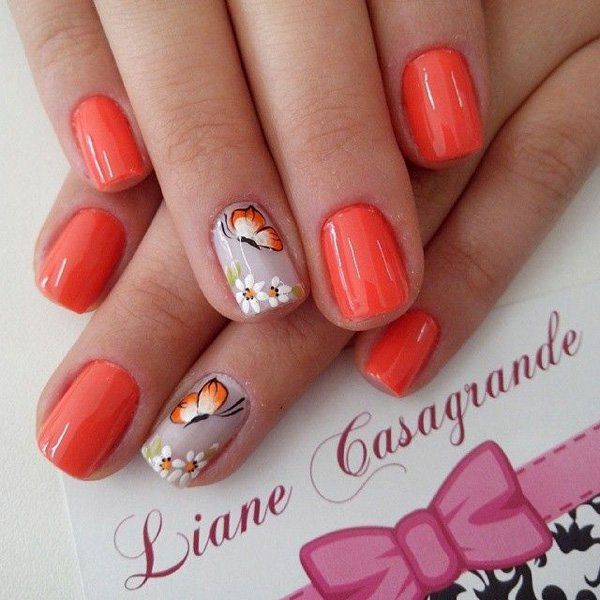 This is a great design if you are looking for something that is not so bright with the light colour and simple yet beautiful design this is one nail art that will not irritate you after a few days. 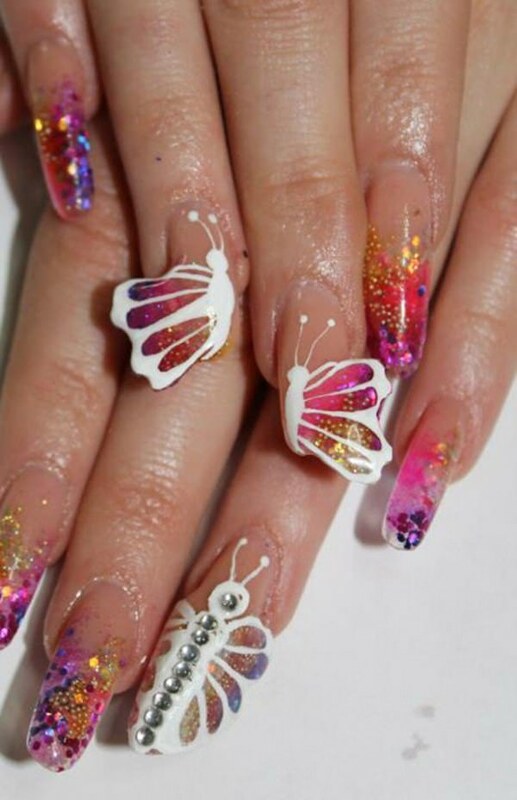 The light colours with only a small bright butterfly and some glitter is a very feminine and minimalist design but in the same way it is makes a statement. This is something most women would wear and fall in love with, it will not take forever to do and maintaining it might be quite easy. 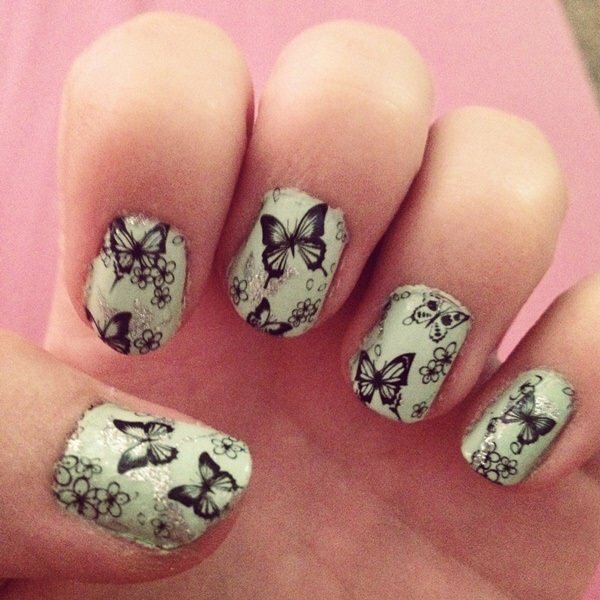 Quite a great design and it looks simple, the details in the butterflies are just enough to make this look great, This might not be everyone’s cut of tea and you might like something a bit more detailed but if you want something simple that still looks good and has detail this might be the perfect design. These designs are simply amazing the details is just amazing. These might be stickers but some nail technicians will be able to paint this on but just be warned you will be siting a while this amount of detail does not happen in 5 minutes. The white is a great background as it will not take any attention away from the butterflies. 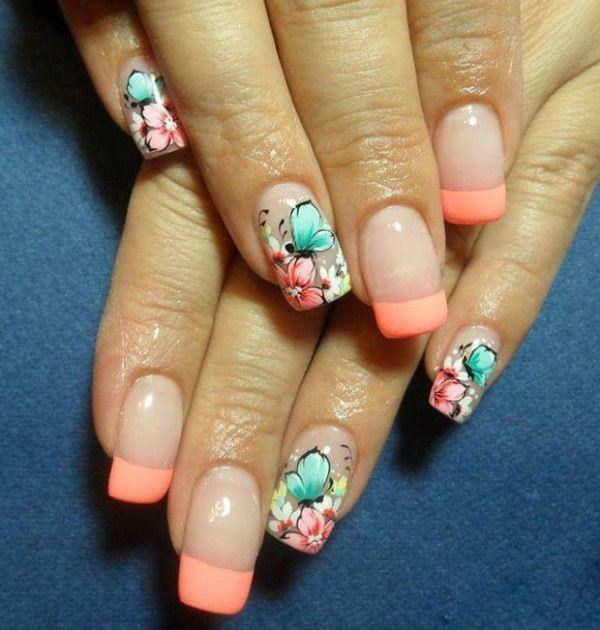 If you are one of those girls that like keeping it simple except for one finger, this will be great for you. 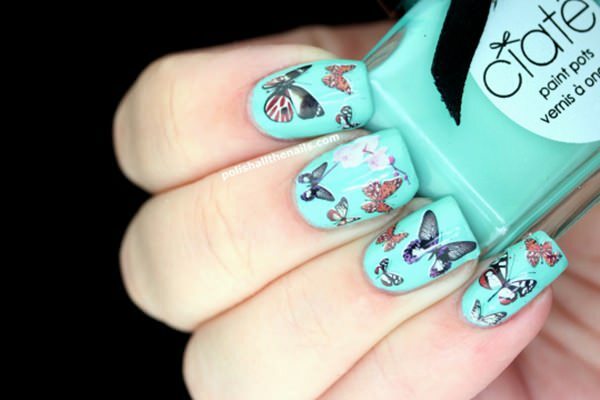 The butterfly is just WOW the detail is amazing and the colours fit so well. 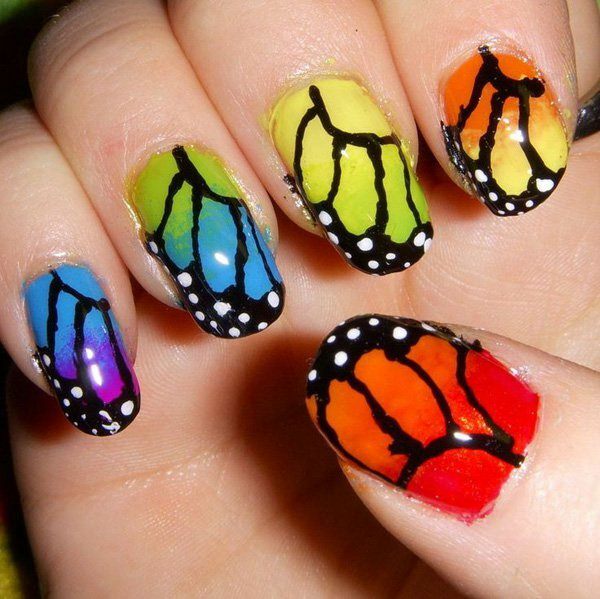 When I think butterfly this colours comes to mind without a doubt. 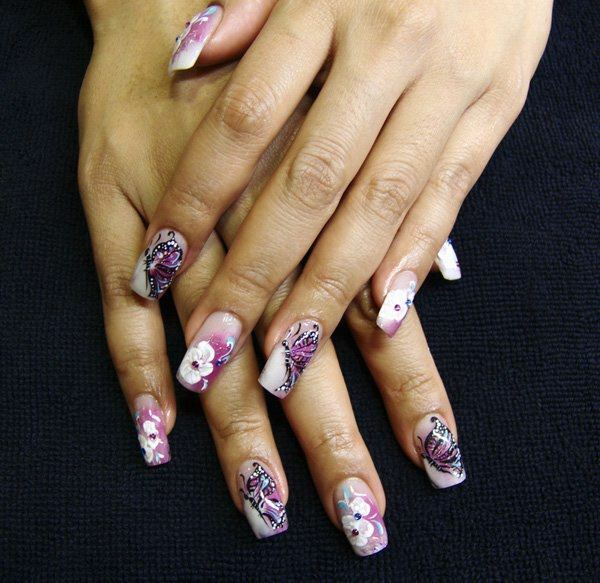 This is something that will be great for anyone that like the simple french tips with just a small bit of art. 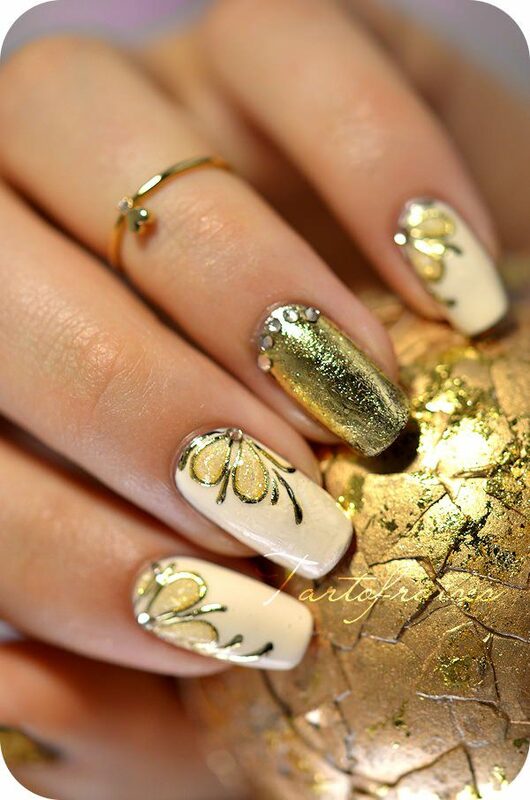 The new trend these days are doing something different to each nail and although this can be a bit too much for most of us I cannot lie this does look great when done correctly but it is a very busy design with a lot of elements to it and a lot of detail so this might not be for everyone. 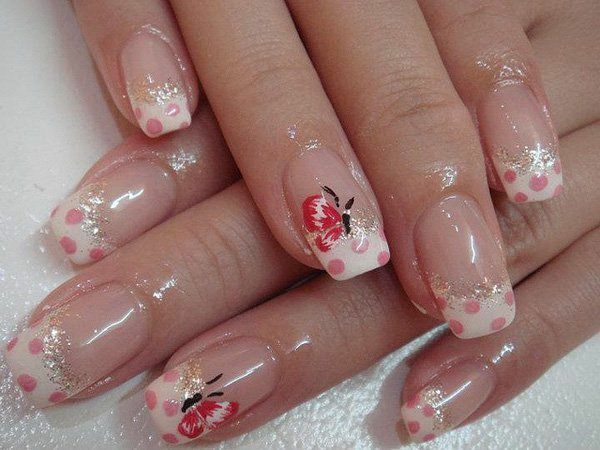 Not everyone has long nails and due to the damage tips will do to your nails this is an amazing design for your short nails, It looks great but not overdone the detail might take a little while to do but it won’t leave you sitting for hours. This is a bling design with a lot of jewels and colours but it still has detail and looks great if you like the bling, This is also one of those designs that can be way too much for some people. 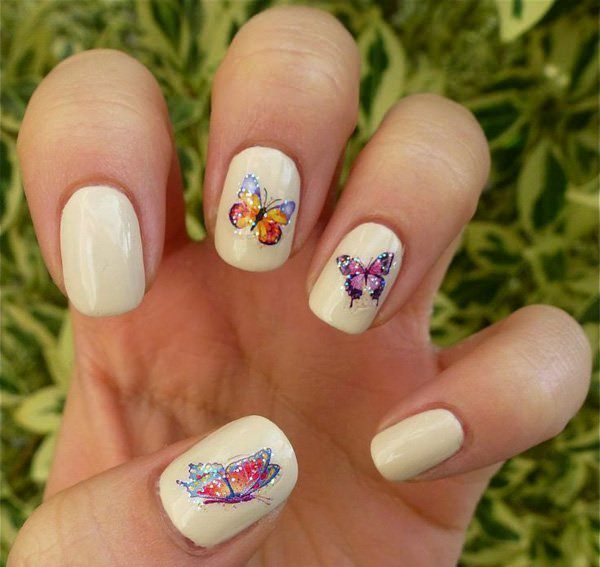 This is a design that has small detail there is a lot of butterflies per finger so this will take time unless it is done by nail art printer or with the stickers but by painting this will be a very timely process as the detail will be extremely small. The title says it all it is such a simple design and the glitter part offers just enough detail to make this stand out. 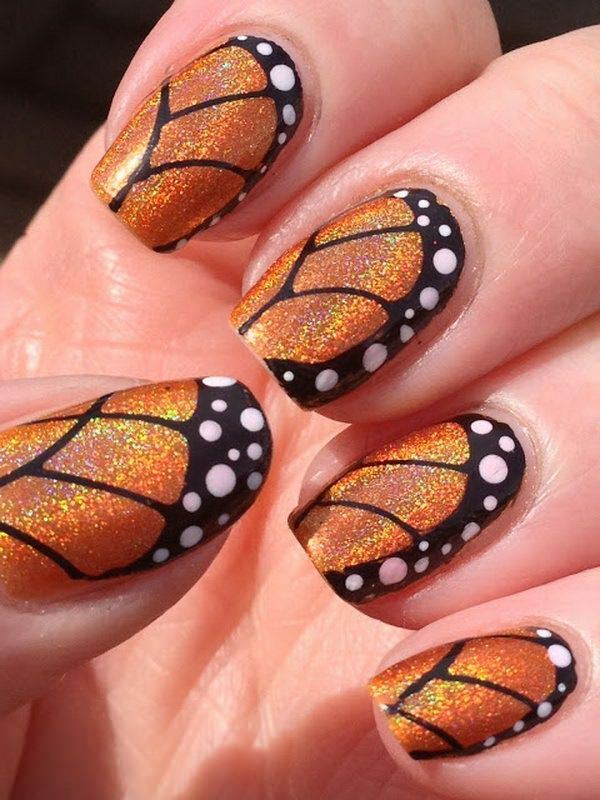 This might be someone who tried to do it themselves or a friend never the less it is still quite nice, it is a wing design that could be done with your nail art pens or small paint brushes and a dotting tool. This must have taken ages if it was painted on and the design and details are just amazing. This might be printed on but it looks painted on and that makes this amazing. This is one more of the abstract type of designs which is quite colourful but also will only be worn by a limited amount of people. Even though this looks absolutely gorgeous you will have to wear it only to a special occasion because these might prove to be irritating and tricky for a daily look due to the 3D art standing out a lot. 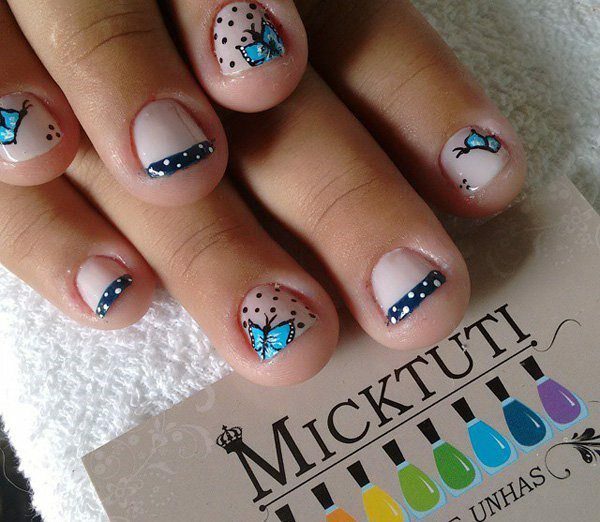 This is such a beautiful design and looks detailed but it is very busy and if you do not look for the butterfly you will miss it. This blue wing design is also quite nice and the ombre colour effect you get just takes it to a whole new level. This design with the glitter just stands out and will look great it is done very well and you can see they used their time well. 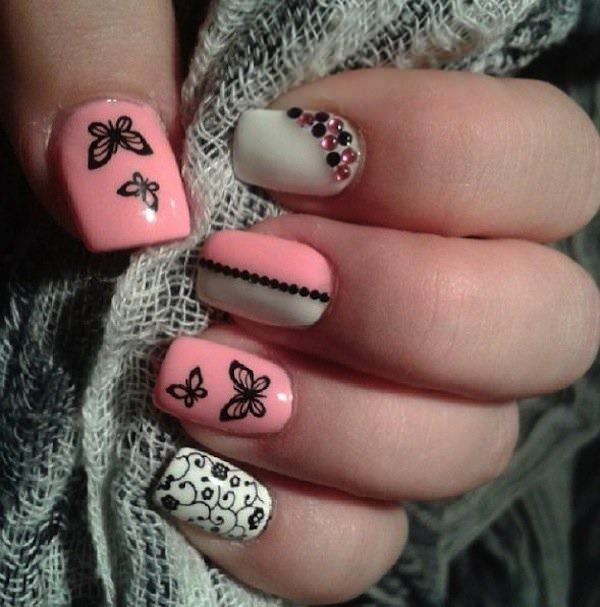 This I done of those that makes everyone want these nails. If you like glitter nails you must love this. 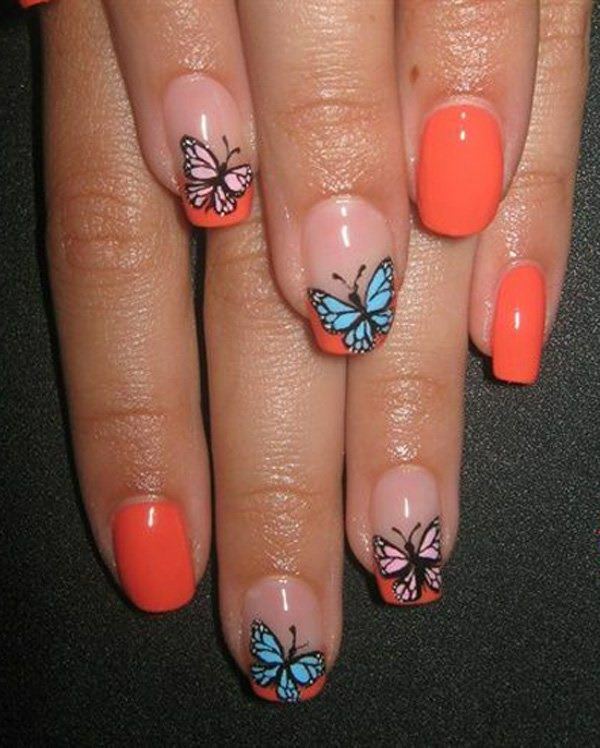 It looks simple but it is great and the one butterfly makes this look perfect for any occasion. These are just some of the amazing designs you will get and there are great DIY ideas out there if you are willing to try some out.